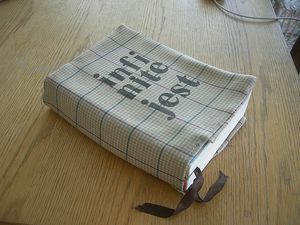 UNC:Infinite Jest, is an article no one will read, about a book nobody has read. It is an hysterical article if you have read the book. The author will make sure he has informed you of that thus. 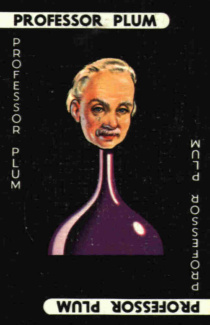 This Professor Plum, has not the time to read dystopic books on the near future. My near future is more concerned with getting this weapon out of this room before it ends up in the little envelope. Talk about dystopias. Have you seen the layout of M Body's mansion? It is ridiculous. The secret passages defy space time. Portal2 has nothing on the Cluedo house. An article for the audience of one, is best served via Email. Mass appeal websites such as Uncyclopedia and OhInternet! strive for SEO Search Engine Optimizations. An article no one will search for about a book nobody has read, simple cannot compete with the likes of AAAAA. Fonzy may have said it first, but Uncyclopedia made it and protected it. All in all, if an article requires a degree in the subject of the article to understand the article it is not serving its purpose. Readers search Uncyclopedias to learn about what they did not know already. They do not want to feel stupid because they think they are not getting a joke found deep in the 1000 or so pages of a book they will never read. Enough about that Infinite just not very funny. People will tell you all sorts of theories on what is funny and even point you to various How to type articles. Funny is what makes you laugh. also Funny in the head. Things are not inherently fun. "That's a fun shirt, you have" really means "I can't believe you bought that, much less wear it out"
Fun nouns are a subset of funny strange. If a reader doesn't want to read an unfunny, not even funny strange, article about a book that nobody has read, there is not much you can do. But there are plenty of funny things to read here, may I suggest Special:Random? This page was last edited on 23 April 2011, at 07:02.